Put ground turkey in a large bowl. Add sea salt, sage, crushed red pepper flakes, and ground pepper. With hands, mix in all ingredients. Heat skillet over medium high heat and lightly coat skillet with olive oil. Shape turkey mixture into patties and place on pan. Cook 3-5 minutes each side or until golden brown. Using a non-stick pan on medium high heat, pour 2 servings of eggs onto pan. Cook egg on one side until you’re able to flip with spatula. Flip egg and add cheddar cheese. Cook until cheese melts. Place English muffins in toaster and brown to your liking. Remove muffins, place on plate. 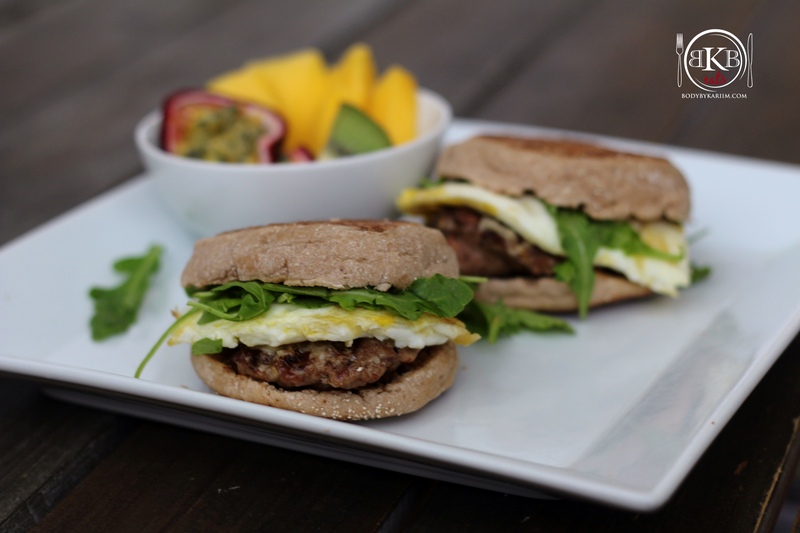 Top with turkey sausage, eggs, and arugula.